The DEWE3-PA8 Mixed Signal & Multi Power Analyzer is the solution for high performance power analysis. Gaplessly record any signal with only ONE instrument. PXI Express Bus Technology ensures highspeed throughput. Overall Power Accuracy 0.04 % guaranteed. 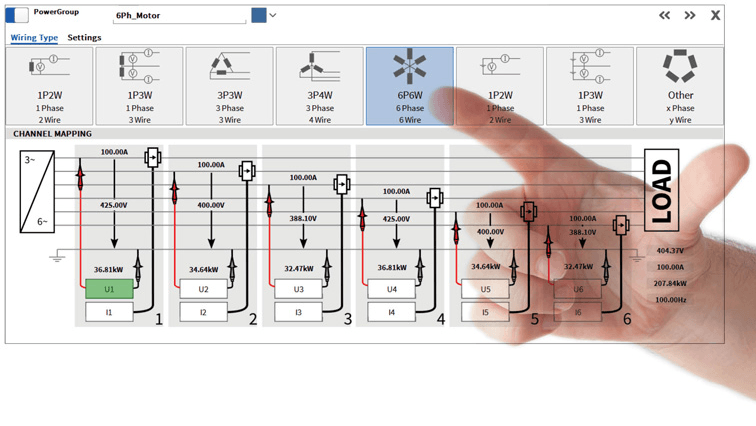 Curious about the next generation Power Analyzer DEWE3-PA8? Schedule a demonstration and experience the system for yourself. A DEWETRON DEWE3-PA8 Power Analyzer is the solution for the simultaneous analysis of several motors, converters or complete drive trains. 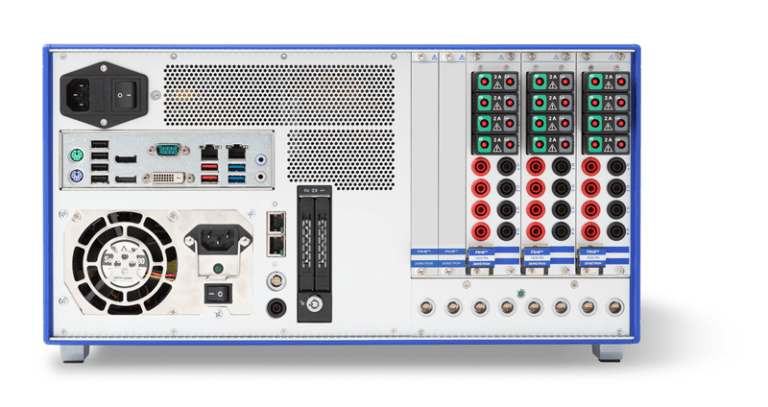 What’s more, up to 16 power channels and the capability to calculate power parameters. For example, polyphase motors (from 1 to 9 phases), turn the DEWE3-PA8, with PXI Express technology, into a multi power analyzer. 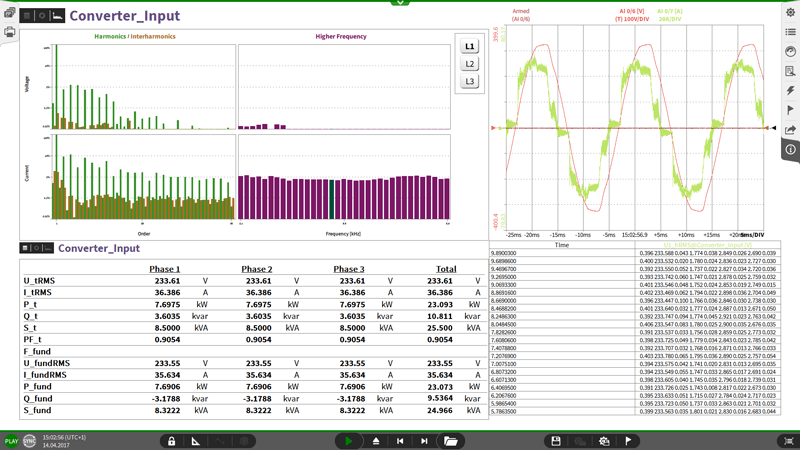 Waveform data, mixed signal and power analysis?DEWETRONs new Power Analyzer does it all. Reliable, gapless recording of any analog or digital signal. At the same time, high performance power calculation of several power groups simultaneously. And significantly, up to 10 MS/s/ch and high dynamic range guarantees data integrity. 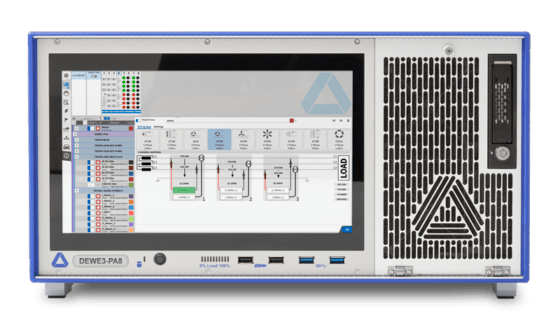 Smart interface technology makes it easy to integrate a DEWE3-PA8 Power Analyzer into automation systems and test bed environments. While also guaranteeing reliable data transmission, easy to use remote control and remote configuration through TCP/IP based protocols. These protocols are in compliance with standardized protocols (e.g. ASAM) and file formats. Dedicated measurement displays with classic design provide critical data values at a glance. 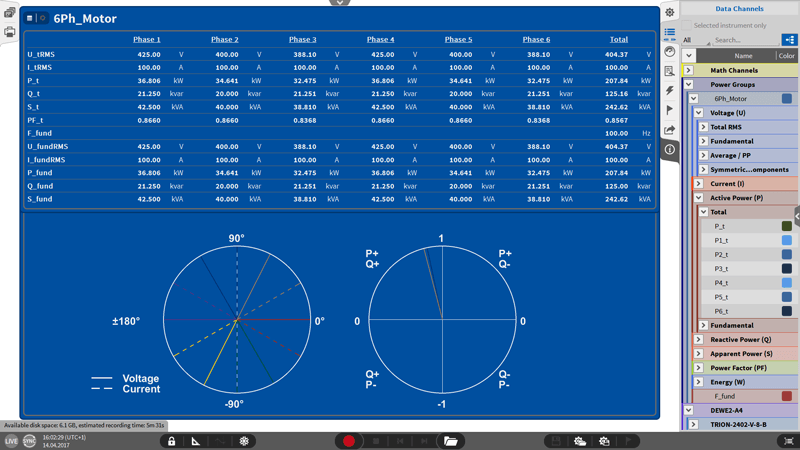 In addition, predefined measurement displays for each user defined group of power channels present an overview table, vector scope and harmonic chart. Different styling presets and data presentation tools are available to tailor the display to your exclusive needs. The 11.6” high resolution display is very bright for maximum readability and ample space for user defined screens. Also the few necessary settings are easily accessed with just a few swipes on the multi-touch display. Accessible and orderly arrangement of signal inputs and power parameters directly on the front. In other words, everything at a glance! Fast acquisition rates and 18-bit A/D conversion. As well as the best linearity of the signal conditioning offers the highest dynamic performance in the whole input range. 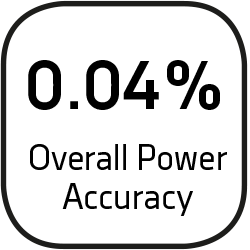 Thanks to the low range error of 0.01 %, the DEWE3-PA8 Power Analyzer achieves a very high accuracy, even with low range utilization. Of course, precision accuracy is guaranteed throughout the whole analysis. The integrated transducer power supply enables the engineer to relinquish an additional supply box and connect the transducers directly to the DEWE2-PA8. Most of the common sensors with ±15 V or +9 V are compatible, also demanding ones (like zero-flux transducers) can be powered thanks to the superior power supply. All DEWE3-PA8 systems are optionally supplied with an EN ISO/IEC17025 certification. Calibration and adjustment are done in the accredited calibration lab at the DEWETRON headquarters. What is a High Speed Power Analyzer? A high speed power analyzer is a power analyzer that offers high speed data acquisition and precision power analysis. Record every single sample into your data file, not just a few seconds. 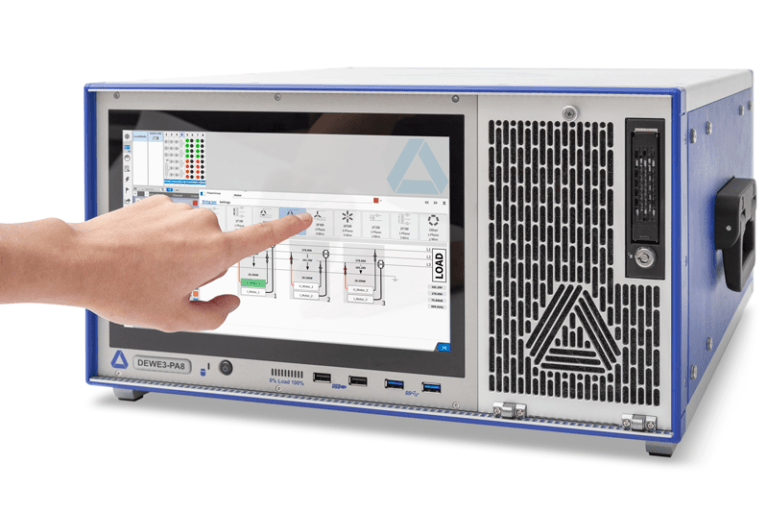 DEWETRON’s Multi Power, High Speed Power Analysis Hardware (DEWE3-PA8) is seamlessly integrated into Automation Systems and Test Benches with smart interface technology. For example, Gbit Ethernet, USB3.0, Ether CAT, SCPI, and XCP. Also standard are gapless data recording, effortless remote control for hazardous or hard to reach environments and remote configuration of the power analyzer through TCP/IP based protocols. Our TCP/IP complies with standardized protocols such as ASAM and file formats. Analyze multiple motors (even polyphase motors up to 9 phases), converters or complete drive trains simultaneously with guaranteed reliable data transmission. ANother key point; up to 16 power channels are available for any DEWETRON signal conditioning card. What’s more, all DEWETRON signal conditioning cards have an integrated A/D converter, standard. In addition, our TRION™ signal conditioning card offers 18 bit A/D conversion and the industry’s best linearity of the signal conditioning. This linearity sets the stage for a continuously high dynamic performance along the complete input range. Even with low range utilization, the DEWE3-PA8 High Speed Power Analyzer’s lower power error of 0.04% delivers high accuracy throughout the entire analysis.